There's four different spots to swim, so there's a pool to suit any mood. Escape the heat and splash around with the kiddos - it's like having a little water park right onsite. Take a break with a refreshing cocktail or a tasty burger at the Yella Umbrella bar. Literally steps from the sand, this resort is right on Myrtle Beach. It's an 11 minute walk to the Children's Museum of South Carolina. Enjoy a refreshing cocktail at the Yella Umbrella Poolside Bar & Grill. 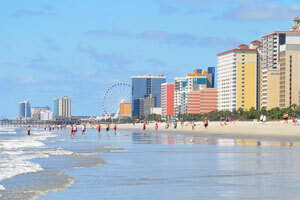 The family-run Dayton House Resort is located right on beautiful Myrtle Beach. Once you get here, you can shift into full chill mode. The views alone are therapy – it’s no wonder that it was awarded the TripAdvisor Certificate of Excellence. Dayton House Resort has four pools – two indoor and two outdoor – so tell everybody to suit up and hit it. Lounge with a cocktail from the Yella Umbrella poolside bar while the kids play Sharks and Minnows in the pool. Now the only question is – Long Island Ice Tea or Strawberry Daiquiri? Relax and unwind as you float along the lazy river or work on your sun-kissed look on the two-acre oceanfront tanning lawn. Enjoy breakfast or lunch at John’s Restaurant, located onsite. Vacation doesn’t have to get in the way of your workout routine. The fitness center contains a variety of exercise equipment and free weights. A post-workout visit to the sauna is a must. Comfortable Studio, Ocean View or Oceanfront Studio condos sleep up to four guests. Need more space? Upgrade to a Ocean View One-Bedroom or Oceanfront One-Bedroom condo to sleep four to six guests. Kitchens have everything you need to make everyone’s favorites. The kids will be begging to help bake your famous chocolate-chip cookies (and be the official taste testers). Freezers have plenty of room for hot pockets, popsicles and bagel bites – all your basic vacation foods. Condos have Cable TV, so there’s no need to worry about missing the big game or your favorite show. Private balconies are perfect for enjoying the gorgeous view and the calm breeze. A cocktail in one hand and the latest issue of People Magazine in the other – what more could you want? When the kids find out all of the fantastic activities that are all less than a ten-minute drive from the resort, you’ll look all the more brilliant for booking. Experience the magic of Neverland at Captain Hook’s Adventure Golf. The mini golf course takes you through the story of Peter Pan in an exciting challenge that everyone will love. The Children’s Museum of South Carolina offers several interactive exhibits that allow children to use their imagination while learning at the same time. They can pretend to be a doctor, or learn about fractions using pizza. Take a ride on the Myrtle Beach SkyWheel to enjoy spectacular 360 views of Myrtle Beach. Thinking of a grownups-only dinner? Head to Hard Rock Cafe Myrtle Beach and peruse their menu of All-American cuisine and signature handmade cocktails as you admire the walls covered with original instruments from music legends. - Rollaway/extra beds are available for USD 10.00 per night. Please note: No motorcycles or trailers are permitted on the property. All guests under age 25 must be accompanied by their parents to check in to this hotel.